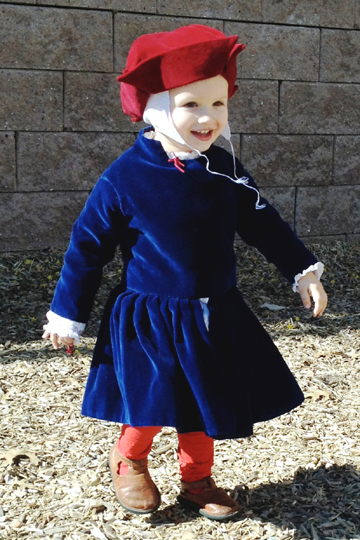 This completely hand sewn outfit is an attempt to recreate the clothing that Henry VIII might have worn as a child in the last decade of the fifteenth century. It includes a red velveteen hat, a linen coif worn under the hat, an embroidered linen shirt, and a blue velveteen doublet. I drafted the hat and shirt by resizing for a child the patterns in The King's Servants (1). The doublet is also based on a combination of patterns from this book. The coif pattern I developed based on the research of Cynthia Virtue (2). The embroidery is from the early 16 th century French pattern book La Fleur de Patrons de Lingerie (3). The ties are braids described in the Complete Anachronist monograph Fingerloop Braids (4), based on a pattern published c. 1475. The upper portion of the doublet is meant to mimic the Bust of a Laughing Child commissioned by Henry VII c. 1498 and thought to be of a young Henry VIII (5). 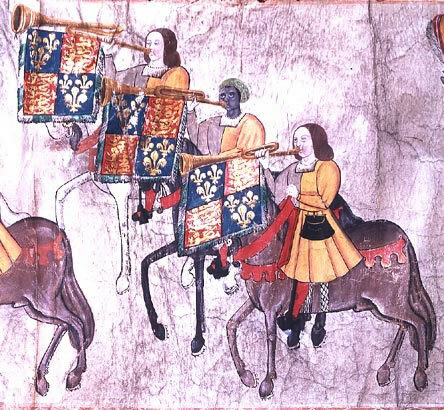 The skirt is like those pictured in the illuminated Westminster Tournament Roll (6). 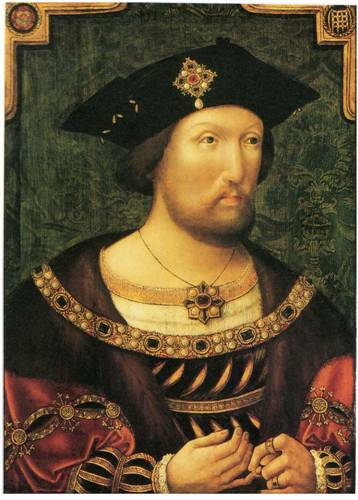 The hat is based on the portrait of Henry VIII c. 1520 (7), although the color and the coif underneath reference the portrait of his young son Edward, Prince of Wales (8). The hat is modeled after the portrait of Henry VIII circa 1520 (right) (7). A pattern for this style of hat appears in The King's Servants (1). I constructed an adult hat, then scaled the pattern to fit my two-year-old. When resizing it, I reduced the brim more than the crown to preserve the overall effect. The hat is cotton velveteen, lined with linen canvas. Although black is the most common color, red is also represented (see portrait of Edward, Princes of Wales (8) and I wanted fabric to match the embroidery on my son's shirt. The brim is stiffened with two pieces of buckram. The hat is hand sewn with linen and silk threads in running and backstitches. My greatest conundrum was how to achieve the final shape. Johnson suggests ribbons tied over the crown of the hat (1) based on evidence from portraits by Hans Holbein the Younger, who worked in England between 1526 and 1543 (9) . Since I wanted an earlier style of hat, like something worn between 1495 and 1510, I looked for inspiration in earlier works. I do not detect ribbons on the bust of Henry VII created in 1509-1511 (10) or in the portrait of Arthur, Prince of Wales c. 1499 (11) , nor in the portraits of Henry VII painted during or after his lifetime (see the Royal Collection www.royalcollection.org.uk , Society of Antiquaries of London www.sal.org.uk , Bridgeman Art Library www.bridgemanart.com , Victoria and Albert Museum collections.vam.ac.uk ) although these portraits usually feature a hat with a turned up brim. I sewed the flaps up with small loops of silk thread tacked through the back side of the brim, and this seems adequate. To secure the red hat to my son's head, I sewed a simple linen coif. If he protests wearing the hat, I can tack the velveteen hat on top of the coif. The young Edward, Prince of Wales, wore his hat over a coif. The coif pattern I based on the research of Cynthia Virtue (2) . The coif is linen, sewn with linen in a running stitch, with a rolled hem. The ties are fingerloop braids based on a fifteenth century pattern (4) . The shirt is a child-sized version of the "Holbein shirt" in The King's Servants: Men's dress at the accession of Henry VIII (1) . It is made of handkerchief weight linen, sewn with linen thread. The interior seams are flat-felled and the edges have a rolled hem. The neck and cuffs are embroidered in red silk with a pattern from a facsimile of a French pattern book published in 1532 or 1533 (3) (see below). The same thread was used to make the fingerloop braids that close the shirt. This braid is one of the simplest fingerloop braids and is documentable to the fifteenth century (4) . I initially planned to make linen ties, but after observing in multiple Holbein sketches and portraits that the ties of shirts with embroidered collars were the same color as the embroidery, I made silk ties (see Edward, Prince of Wales, with a Monkey) (12) . I constructed the shirt and, being well pleased with it, felt that such a shirt required a complete ensemble for my child, so I designed the doublet. 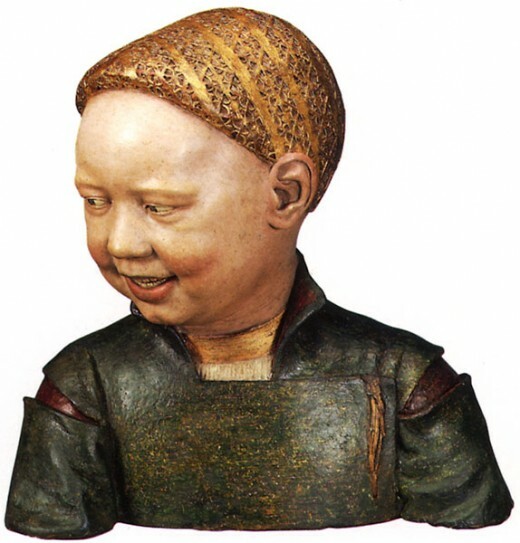 I took inspiration from a bust commissioned by or given to Henry VII in 1498, showing a laughing child often thought to be the young Henry VIII (right) (5) . To complete the lower portion of the doublet, not shown in this sculpture, I referenced the images in The King's Servants, most especially the Westminster Tournament Rolls of 1511 (below) (6) . The doublet is blue cotton velveteen, lined with brown linen and interlined with linen canvas. It is sewn with linen and silk threads and closed with metal hooks and bars. The remnant of fabric I used required that I piece a portion of the skirt, which I placed in the center back of the garment, hoping that the piecing would be less noticeable there. I observed that the laughing child's doublet has a standing collar cut as one piece with the body, set in sleeves with a slash in the upper arm, and a right front panel that overlaps the torso as far as the left sleeve. I examined the coat pattern from The King's Servants (1) to learn how to create this style of collar, as I had never done this before. Johnson's instructions for how to construct a jacket gave me confidence when designing the overlapping front panel. I drafted sleeves based on the instructions in The Medieval Tailor's Apprentice (13) but did not attempt to recreate the slash, as the cotton velveteen frayed too easily for this treatment. The white linen canvas at the waist is a lacing strip for pointing up hosen, should I later make some for my son. Knowing that this garment would take considerable time and effort to construct, and that toddlers grow at an alarming rate, I attempted to include in the design several ways of expanding the doublet. While these techniques are not documentable to period, they work for making SCA garb. The sleeves and sleeve linings can be picked apart at the wrist and extended over another inch. When the sleeves become too snug, they can be removed entirely, as the sleeves and body of the doublet are lined and finished separately, then whip stitched together into the armscye. The hooks and bars on the torso can be moved to allow for increased girth. The skirts are quite long, so as he gains height, they will still look appropriate. The body sections are cut longer than where I sewed the waist seam. If his torso lengthens appreciably before he gains too much circumference, I can remove the skirt, unfold the extra fabric that is currently inside the body of the doublet, and sew the skirt back on. However, constructing this part of the garment was slower and more difficult than I anticipated, and I do not relish picking out and re-setting the waist seam. I have enjoyed the challenge of designing and constructing these garments, but have been especially pleased to have been able to do it completely by hand. Only the muslin doublet mock-ups ever graced a sewing machine, and while this means that my process has been slow, it has magnified my pleasure. I hope that many people are able to smile at the sight of my son wearing this clothing in the future. 1. Johnson, Caroline. The King's Servants: Men's dress at the accession of Henry VIII. Surrey, UK : Fat Goose Press, 2009. 2. Virtue, Cynthia aka Cynthia du Pré Argent. How to make a Coif: 1 and 3 piece patterns. [Online] www.virtue.to/articles/coif.html. 3. Nourry, Claude & Pierre de Saincte Louie. Patterns: Embroidery: Early 16th Century. Berkeley, CA : Lacis Publications, 1999. 4. Fingerloop Braids. Swales, Lois & Zoe Kuhn Williams. 108, 2000, Complete Anachronist. 5. Mazzoni, Guido. Laughing child, possibly Henry VIII. The Royal Collection, London : c.1498. 6. Westminster Tournament Roll. The College of Arms, London : 1511. 7. Unknown. Henry VIII (1520). 8. Holbein, Hans the Younger. Edward VI as a Child. National Gallery of Art, Washington, DC : 1538. 9. Roberts, Jane. Holbein. London : Bloomsbury Books, 1979. 10. Torrigiano, Pietro. King Henry VII Bust. Victoria and Albert Museum, London : 1509-1511. 11. Portrait of Arthur, Prince of Wales. Bridgeman Art Library, London : c.1499. 12. Holbein, Hans the Younger. 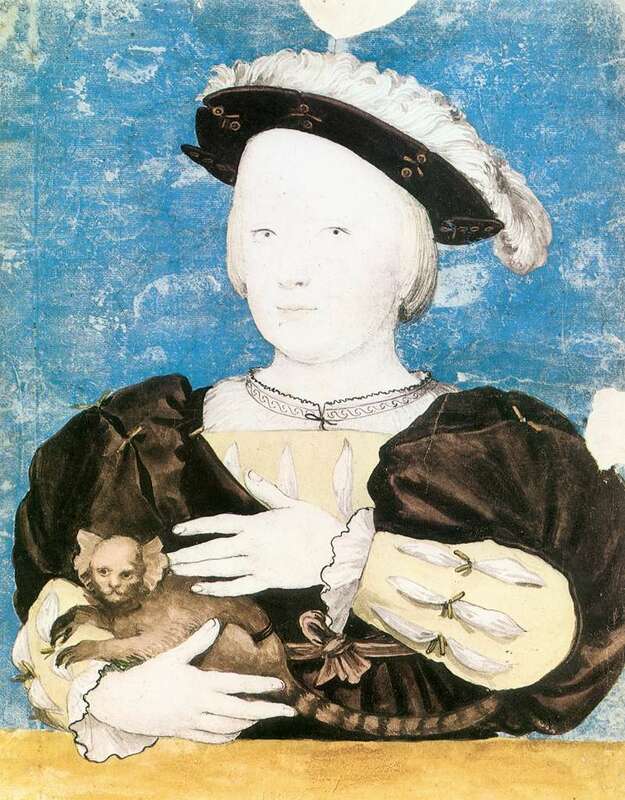 Edward, Prince of Wales, with Monkey. Kunstmuseum, Öffentliche Kunstsammlung, Basel : 1541-42. 13. Thursfield, Sarah. The Medieval Tailor's Assistant: Making common garments 1200-1500. Hollywood, CA : Quite Specific Media Group, 2001.